Death toll is expected to rise after a 7.1 magnitude earthquake strikes 120km from Mexico City, collapsing buildings and killing more than 224 people. The education secretary says more than 200 schools in Mexico City have been affected, 15 suffering major damage. Reuters reports that Mexico’s interior minister has said that at least 224 people have been killed by the quake. Images have come through from the scene of the collapsed Enrique Rebsamen school, where at least 20 children have died. There is some remarkable and terrifying video footage of a section of road rising and Enrique Peña Nieto urges calmMexico’s president has issued a video statement urging people to stay calm in the aftermath of the earthquake. 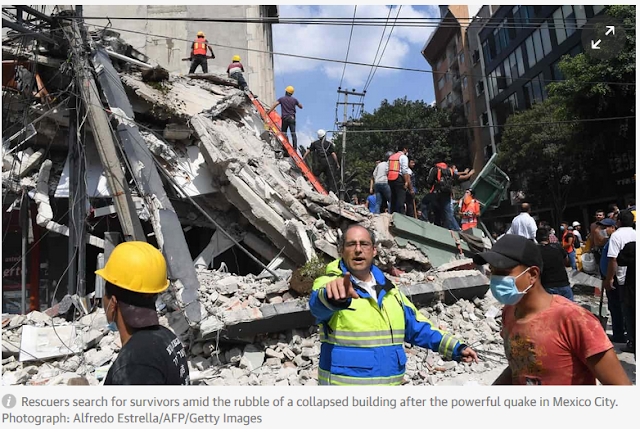 AP reports that Enrique Peña Nieto said in the message issued late on Tuesday night that many people will need help, but the initial focus has to be on finding people trapped in wrecked buildings. “The priority at this moment is to keep rescuing people who are still trapped and to give medical attention to the injured people,” he said.Peña Nieto said that as of late Tuesday 40% of Mexico City and 60% of Morelos state have no electricity.